The amount of surface that a plane figure covers is called its area. It’s unit is square centimeters or square meters etc. A rectangle, a square, a triangle and a circle are all examples of closed plane figures. In the following figures, the shaded region of each of the object is the surface occupied by it. We call it area. The part of the plane enclosed by a closed figure is called the interior region and the part of the plane outside the enclosed figure is called the exterior region. In the adjacent figure a rectangle ABCD is shown. It’s interior and exterior regions are also shown here. Area is always measured in squares and the unit of area square units (sq. cm., sq. m. or cm2, m2). We measure a given region by a unit region and find how many such unit regions are contained in the given region. The measure of a region is called its area. The area is always expressed in square units. The standard units that are generally used for measuring area are square centimeter and square meter. The area of a square with side 1 cm each is 1 cm × 1 cm = 1 square centimeter. In short, it is expressed as cm2 or sq. cm. The area of a square with side 1 m each is 1 m × 1 m = 1 square meter. In short, it is expressed as m2 or sq. m.
Area is a measure of any area surface, e.g., the surface of a table, the surface of your pencil box etc. It means, to find the area of any surface we need to know two sides. Note: Here we’ll discuss only areas of square and rectangles. 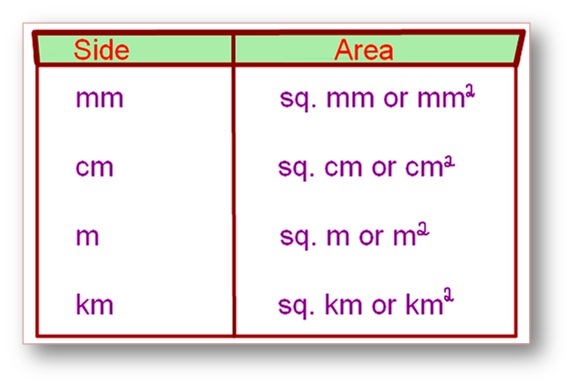 Given below is a table of units of sides and corresponding units for areas. 1 m.	=	100 cm. 1 sq. m.	=	10000 sq. cm. 1 cm. =	10 mm. 1 sq. cm. =	100 sq. mm. For finding the area of a given figure, make sure that the sides (length or breadth) are in the same unit of length. If they are given in different units, change them to the same unit.